Picture caption: The Lord Mayor of Leeds Cllr David Congreve was joined by youngsters, mums and representatives from Keepmoat including their official mascot Ken, as he helped hand out Easter eggs at Leeds Children’s Hospital. 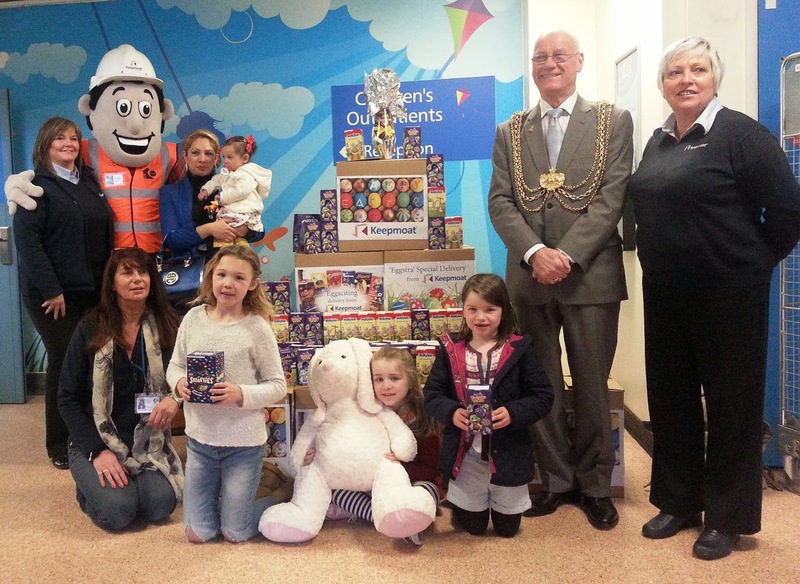 Young patients at a city hospital were given an Easter surprise by the Lord Mayor of Leeds Cllr David Congreve as he made a special trip to distribute over 400 chocolate eggs. Kindly donated by community regeneration specialist Keepmoat, the eggs proved to be a big hit with youngsters who are currently accessing a range of specialised services at Leeds Children’s Hospital, which this year is the Lord Mayor’s chosen charity. A host of events have already been held in the city to raise funds for the Lord Mayor’s appeal, and this month a campaign was launched asking the residents of Leeds along with local businesses, educational establishments, groups and organisations to possibly spare ‘Just One Day’ on Friday 24 April to help the hospital. Whether it is organising a cake sale, taking part in a sponsored event, donating a proportion of sales from an activity or performance or even wearing fancy dress, this is a fantastic opportunity to show your support and assist the tremendous work of the Leeds Children’s Hospital. Every penny which is raised is guaranteed to go towards a number of improvements at the hospital ranging from the buying of new equipment to the brightening up of wards and family rooms. Joining the Lord Mayor at the children’s hospital was the Lady Mayoress Janet Harper JP and Chrissy James, Gail Fairbank and ‘Keepmoat Ken’ from Keepmoat. "This year I am supporting the Leeds Children’s Hospital as my chosen charity, and it was brilliant to be able to visit the LGI and be able to hand out over 400 Easter eggs to youngsters kindly donated by Keepmoat. "We have been working extremely hard to raise money for the hospital in many different ways, and it would be really fantastic if residents, local businesses, organisations and groups could as part of my ‘Just One Day’ event on Friday 24 April, spare any time to raise funds for my charity appeal. "We will make sure that all proceeds from the day are given to the Leeds Children’s Hospital, whose staff, day-in day-out, does such a wonderful job looking after our youngsters." "Keepmoat is building 388 new homes, refurbishing 1296 existing council homes and providing the repairs and maintenance for 20 years on the Housing Regeneration Project with Leeds City Council. "We have over 400 employees on this contract who have kindly donated Easter eggs. It was wonderful to see the children’s faces light up with the Easter egg delivery and special guest, Keepmoat Ken. The occasion was made extra special with The Lord Mayor visiting to bring a smile to those children who have to be in hospital during Easter." Leeds Children’s Hospital is the second largest service for children in the country and was created in April 2010 by bringing all children’s inpatient services together in one location at the Leeds General Infirmary, solving the issue of seriously ill youngsters having to be transferred across the city. The range of specialised children’s services in Leeds that has evolved to meet the needs of the local, regional and national child population is extensive. Our children’s services admit over 30,000 children to our wards each year, we treat over 109,000 children in our outpatient departments and see nearly 60,000 children each year through our Accident and Emergency Department.